Vrindavan which Falls in Mathura District of Uttar Pradesh is at a distance of 160 km from Capital of India and is situated on the banks of River Yamuna. Vrindavan tour package is among one of the most famous pilgrimage centers for the Hindus and one of the oldest cities in the country. The holy town of Vrindavan is known for God Lord Krishna. It is the place where Lord Krishna spent his childhood. 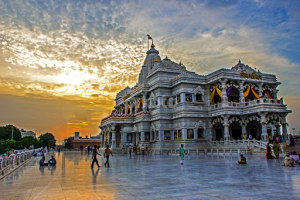 Now a Day Vrindavan is also famous for its most prominent sites of ISKCON Temple, an association of Krishna devotees. 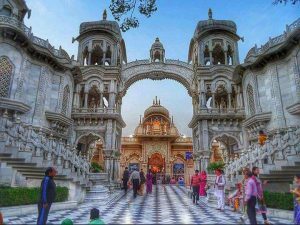 The city of Vrindavan Consist of about 4,000 temples, some of the famous temples are Bankey Bihari Temple, Govind Dev Temple,Madan Mohan temple, Radha Vallabh Temple, Nidhivan temple, the Pagal Baba Radha Raman Temple and Newly Built Prem Mandir are the popular and most visited Vrindavan temples. It is said the Holi and Janmastami was the best festivals for Lord Krishna thus these are the major festivals celebrated in Vrindavan. The Holi festival attracts national and international tourists to this town. Tourists can also visit nearby Barsana where the interesting tradition of Lath Mar Holi is observed. The place is especially interesting during the festival of Holi when the women of Barsana attack the men of nearby village Nandgaon with sticks and play the Lath Mar Holi. Agra or Delhi is the closest airport from Vrindavan, and the nearest Railway station is at Mathura which is about 15 km. Mathura tour is also quite famous among tourist because it is birth place of Lord Krishna. One can cover Mathura, Vrindavan and TaJ Mahal tour package in 2 days which will leave life long impression on you. If you’d like to chat about visit India or need help finding a holiday to suit you we’re very happy to help. Previous Post Top 6 Most Iconic Forts in India.